JCT600 and GardX are delighted to announce joint team sponsorship of West Surrey Racing for the 2015 Dunlop MSA British Touring Car Championship. 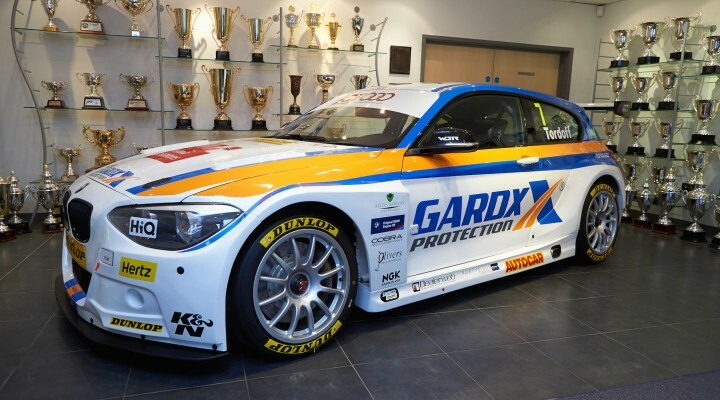 The new partnership will see both Sam Tordoff and Rob Collard piloting the all-conquering BMWs under the ‘Team JCT600 with GardX’ banner. WSR – one of the world’s leading and most successful touring car teams – took a clean sweep of BTCC titles in 2014, culminating in a quartet of trophies being proudly displayed at its Surrey base. The multiple champion squad has already enjoyed an exciting off-season having announced that young gun Tordoff would be team-mate to the experienced race-winner Collard, whilst three-time World Touring Car champ Andy Priaulx will drive a third WSR-run BMW 1 Series. The outfit has far from rested on its championship winning laurels, however, having continued to test and develop its machines over the winter in preparation for a title defence with JCT600 and GardX. Both JCT600 and GardX have a long association with motorsport. JCT600 founder, Jack Tordoff, was a successful International Rally Driver in the 60’s and 70’s, winning the Circuit of Ireland Rally in his ubiquitous Porsche 911 Carrera RS back in 1973. His Grandson Sam is now following firmly in his footsteps having cut a rapid ascent through the motor racing ranks. From karting through to race-winning campaigns in both the UK Renault Clio Cup and Porsche Carrera Cup GB, Sam’s cars have always carried both the JCT600 and GardX logos. That tradition continued in his first two seasons in Britain’s premier series, the BTCC, where the Yorkshireman claimed two victories. Now making his move to the most successful team on last year’s grid, and with the continued support of JCT600 and GardX, Tordoff believes he is in the best possible position to contend for a maiden tin top title. Collard meanwhile is preparing to start his sixth successive season with WSR, bringing a wealth of speed and experience that has seen the popular Hampshire driver score an impressive eight career victories so far. JCT600 are one of the UK’s most highly respected Motor Retailers with 50 Dealerships across the North of England and have represented the BMW brand in Yorkshire since 1978. GardX are the sole supplier of Vehicle Protection Systems to JCT600, providing exterior and interior protection solutions on all retail vehicles sold. Along with their industry leading products and services, both companies are equally delighted to be so heavily involved with one of the world’s best series’ and touring car teams. The team will use a range of GardX products throughout the season, highlighting the success and effectiveness of the brand. GardX Protection provide industry leading products for the motoring world, famously known for their paint and fabric protection. They also offer an innovative range of insurance based products, including Complete Wheel Protection, Cosmetic Accident Repair and GAP. In addition to this, a range of GardX Aftermarket products such as fuel and engine additives, emergency tyre repair and air conditioning cleaners, are also available. The striking pair of German machines will sport the familiar BMW white during the BTCC season and be complemented by colours representing both JCT600 and GardX in a design that is sure to delight fans up and down the country. Please see the attached images and associated video to get the full look before the cars are officially unveiled at the BTCC Season Launch on Tuesday 24th March at Donington Park. The opening round of the 2015 Dunlop MSA British Touring Car Championship will take place at Brands Hatch on 4/5 April. ITV broadcasts each and every race live and in high definition on ITV4, whilst trackside crowds are regularly upwards of 40,000 at each venue.